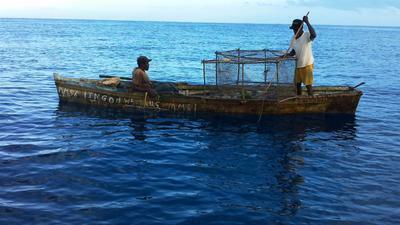 I saw these fishermen quite far offshore, I bought some baitfish from them and snapped this shot. In reviewing my photos I saw the message on the hull of the boat. Jamaica is beautiful , Jamaican spirit is priceless. RJVacations response: I have to agree 100% with your comment on both Jamaica and Jamaican spirit. Your shot is lovely - I know blues aren't usually described as being warm, but that's what I'd have to say about this photo - a really warm blue. As for the "In God We Trust", that's a mantra many of us live by. Thanks for this. 'In God We Trust' is the American motto, which is a mantra which should be applied by ALL, (if indeed you trust in God. Join in and write your own page! It's easy to do. How? Simply click here to return to Jamaican Photos - Moments to Remember.